NAI Vegas & NAI Excel are thrilled to announce that Eric J. Larkin has been awarded the SIOR Designation by the Society of the Industrial and Office Realtors, a leading global professional office and industrial real estate association. To achieve the SIOR designation, Larkin was required to complete at least five years of creditable experience in the highly specialized field of industrial and office real estate; meet stringent education requirements and demonstrate a professional ability, competency, ethical conduct and personal integrity. Individuals who hold a SIOR designation are top producers in the commercial real estate field and are represented in more than 686 cities in 36 countries around the world. SIOR enforces a strict code of ethics and requires designees to complete its ethics course within their first three years of membership. Larkin, licensed in both Nevada and Utah, has been with NAI Vegas and NAI Excel for 6 years and specializes in representing corporate clients, tenants, institutional property owners, and developers. Larkin has an extensive knowledge and understanding of investment analysis, property valuations and lease negotiations resulting in the completion of over 100 million dollars in transactions. Larkin also holds the CCIM designation. NAI Vegas is the local representative of NAI Global, the premier international real estate services organization, with over 400 offices in over 55 countries. Founded in 1988, NAI Vegas has proven itself to be the leading real estate brokerage in Las Vegas. Principals of NAI Vegas have been involved in investment and commercial real estate in Las Vegas since 1972 and have brokered, developed over $5 billion in transactions consisting of multifamily units, retail centers, office buildings and land. Our strength is international and our passion and focus is local. 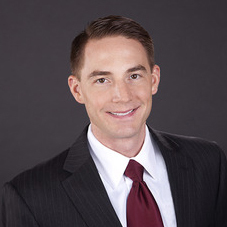 Mr. Larkin joined NAI Vegas in 2013 with 7 years of experience coming from a regional brokerage firm specializing in representing institution landlords, REITs, insurance companies, lenders, receivers, and developers. Mr. Larkin’s extensive knowledge and understanding of investment analysis, property valuations, and lease negotiations has resulted in the completion of over 100 million dollars in transactions including leases, REO and distressed debt sales, trustee sales, and short sales.